At Texarkana Harley-Davidson, all three of the store’s technicians have participated in Harley-Davidson-certified training programs a total of nine times. Roughneck Harley-Davidson in Longview has one of the very few female Master Technicians in the country. 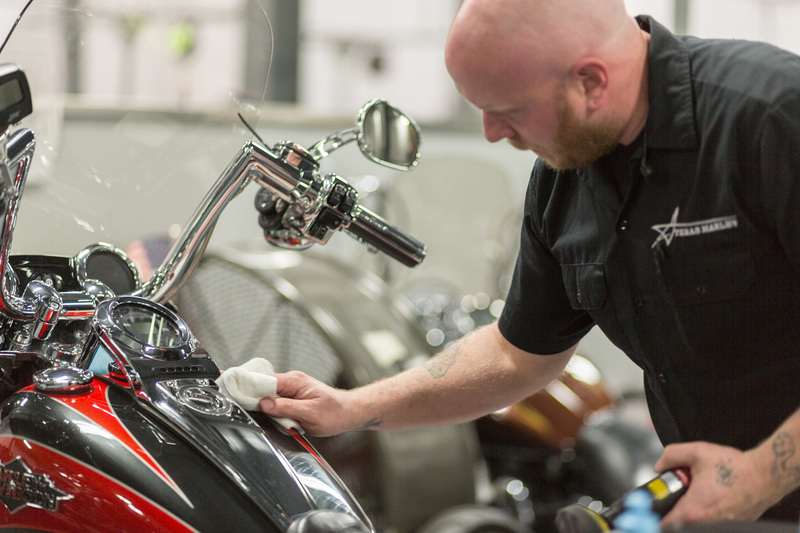 And all of the dealerships (Texas Harley-Davidson, Lumberjack Harley-Davidson and H-D Waco) have a long list of special tools and equipment in their service departments, giving team members access to train on and serve customers with the latest powersports technology. Our culture is one of collaboration, inclusiveness and passion for the motorcycle lifestyle. It’s also one of celebration of success. Texas Harley-Davidson's Steps of Legends stairwell, for example, displays names of team members who have served for a decade or accomplished something exceptional as part of the Texas Harley-Davidson team. We have the stores, support and training programs in service, sales and parts to get you where you want to be professionally. We won’t hold you back. If you are looking to surround yourself with the motorcycle industry’s top talent and leadership, and to grow to your potential, visit the careers pages on each of our dealership’s websites. At Texarkana Harley-Davidson, all three of the store’s technicians have participated in Harley-Davidson-certified training programs a total of nine times.